With Ansermet and the Orchestre de la Suisse Romande. Without a doubt, the Second Symphony in B minor best reflects Russian feeling and temperament. The Scherzo, with its throbbing horns, march rhythms and thrilling woodwinds, is equally electrifying. The contemplative Andante is followed by a highly explosive Finale based on two Russian dance melodies which are widely varied during the course of the music. 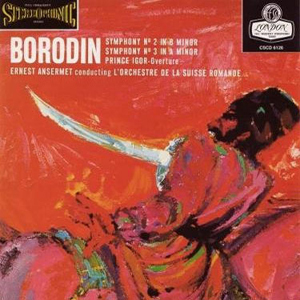 Anyone believing in the old adage that science and the fine arts do not mix must rethink his ideas when he becomes acquainted with Alexander Borodin's biography and his music. The Russian professor of chemistry constantly stole time from his lectures in order to compose; it was musical elements and formulas rather than chemical ones that occupied him. Without a doubt, the Second Symphony in B Minor best reflects Russian feeling and temperament. It's rather harsh and mechanical theme is contrasted first by a lively little song and later by a conciliatory second subject. Cheerful and soothing melodies are heard in ever new combinations until the main theme returns once again and the movement is brought to a powerful close. Selections: Symphonies No. 2 & 3, Overture from Prince Igor.